From a very young age, Anne Gallant knew she wanted to be a painter. After studying at Mount Allison University in New Brunswick, she went to Toronto to learn graphic design. Although she had to move away from her home de develop her talent as a painter, she knew she would come back to Prince Edward Island to pursue her passion for the arts. Anne studied business management in a program offered by CBDC Central PEI. The Self-Employment Benefits Program in cooperation with Service Canada provided her with the tools and training to start up her business, Artistic Illusions. 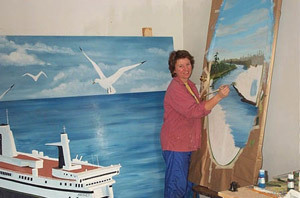 Anne gives presentations on painting, teaches and paints large murals. She is giving art classes year round. Her art can be seen all over the Summerside region, including at the Prince County Regional Hospital and the Village of Wellington. Anne is thrilled to be making a livng while also realizing her dreams. You can visit Anne at her gallery located at 59 Broadway Street in Kensington (across from the train station).